Tweet and response: polling religious interest globally? It looks impressive, doesn’t it? The good folks at Pew have obvisouly done their homework. Even when people try to remember that religion is part of geopolitics, they seem to suffer from selective amnesia. 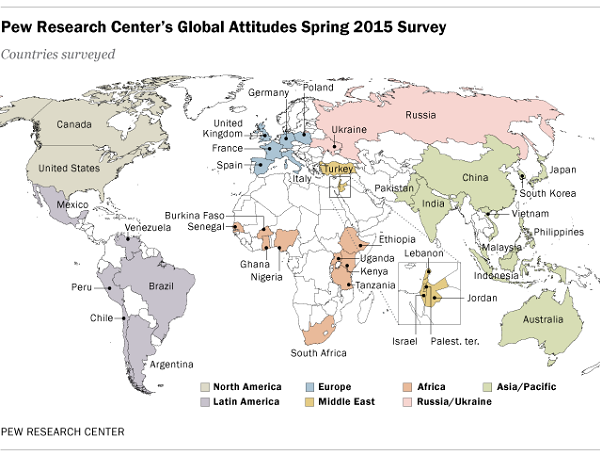 The white spaces are either not countries, or not surveyed — a pity either way. Furthermore, once we’ve got that covered, we’ll need two polls that dig deep & narrow for every one that digs wide & shallow. Oy.